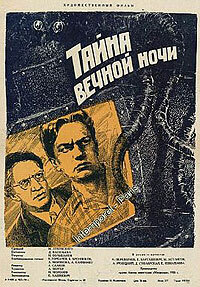 Tayna Vechnoy Nochi (1956) - Sci-fi-central.com. Soviet Union  1956  76m   Directed by: Abram Room, Dmitriy Vasilev.  Starring: Ivan Pereverzev, Konstantin Bartashevich, Mikhail Astangov, Apollon Yachnitskiy, Danuta Stolyarskaya, Yelena Izmailova, P. Samarin, Ye. Tarkhanov, Yan Yanakiyev, Ivan Zhevago.  Music by: Igor Morozov. Following an extremely powerfull earthquake a new type or radiation emerges from the innards of the Earth which threatens mankind and gives birth to a new mysterious creature. A submarine is send to the bottom of the ocean to investigate the strange occurances.